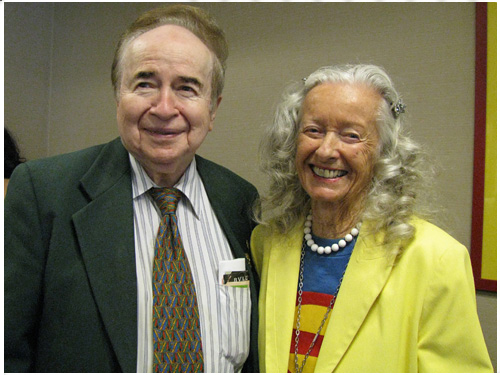 Joe Franklin and Noel Neill in 2009. Photo courtesy of Bill Dillane. For over forty years, Joe hosted a television talk show in New York, including becoming a bit of a national series, when WOR-TV became a cable “super station” in the late 1970s. Franklin’s television program came to an end in 1993, but his Saturday overnight radio show on WOR lasted another eleven years, and until recently, he was still contributing show business reports to Bloomberg Radio. But what should also be noted here is how many science fiction and fantasy writers, and comic book talent, made their talk show debuts on Joe’s program. Because of the simple breadth of the series (there were episodes that could easily feature twenty guests in one hour! ), Joe featured a plethora of the noted, and unusual. And just about any nostalgia and other conventions of the era were welcome to plug themselves on his show. Long time science fiction fan, and noted historian (and television executive) Chris Steinbrunner had a long involvement with Joe and his program. In my own personal history, I find it intriguing that on the morning I woke up in the hospital, after being hit by a car in early 1975, one of my new “roommates” found one of my youth’s heroes, Buster Crabbe (Flash Gordon, of course), guesting that day, on Franklin’s show. I guested on the show a bunch of times, and now find it incredibly foolish — in my callow teens! — that I somehow turned down an invitation to co-host the show roughly every few weeks, to be — as Joe liked to call such folk — his “anchorman” for the hour. Off the air, if he trusted you, Joe was incredibly funny — I mean Carson level funny. For whatever reason, Joe decided to present himself a bit as a “square,” a straight-shooter on TV. But in “real life,” he was hip, and could be, when the moment was appropriate, just a tiny bit saucy. More importantly, in all the decades, I’ve never heard a truly bad story about Joe. It’s intriguing to note that Joe was “one of us.” To his last days, Franklin was a collector of show business, and other ephemera. It was not uncommon to see Joe at one of New York’s paper shows, and other festivals, not necessarily as a guest, but as a customer. Somehow, Franklin had never met the most famous Lois Lane, and he was thrilled — or so it very much seemed! — at the prospect. It is amazing the tens of thousands — hundreds of thousands? — of people Joe helped, with appearances on his shows, and elsewise. I believe he always knew how much so many people loved him. This entry was posted in In Passing and tagged James H. Burns, Joe Franklin by Mike Glyer. Bookmark the permalink. In the department of ultra-trivia, his son Brad gave me my very first job in publishing, at TEEN BEAT magazine, when I was 15.